For a second straight week, a Seward County Lady Saint will be bringing home a NJCAA National Player of the Week Award. 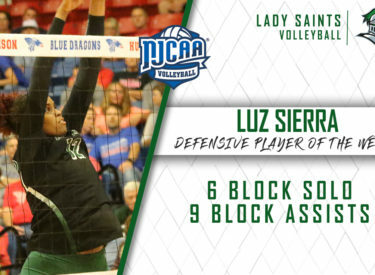 The NJCAA announced Thursday that sophomore Luz Sierra has been named the NJCAA National Defensive Player of the Week. This comes a week after Giovanna Tapigliani was named the NJCAA National Offensive Player of the Week. After a slow start to the week, Luz Sierra turned it on during Saturday’s match as the 6-6 middle hitter went on a blocking frenzy. Sierra helped push the Lady Saints past No. 2 Iowa Western with a great third set performance, at one point recording four straight blocks to propel Seward to a 3-1 victory. In the win over MSU-West Plains, Sierra was the spark the Lady Saints needed, helping Seward overcome a 20-17 third set deficit by racking up four straight points to give Seward a lead they wouldn’t relinquish. The Lady Saints will travel to El Dorado tonight to take on the Butler Grizzlies in a Jayhawk West tilt. Seward’s tough schedule will continue this weekend when they travel to Tyler, Texas to take on No. 7 Navarro, North Central Texas, Blinn and No. 14 Tyler in the TJC Invitational.